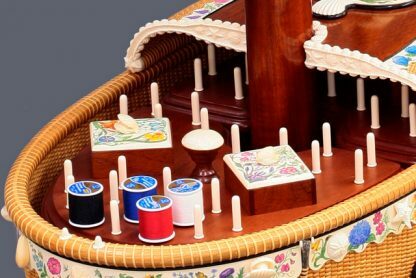 This one of a kind creation made by Michael Kane stands 4’5″ tall, 32″ wide and is a fully functional Nantucket Lightship Sewing Basket. 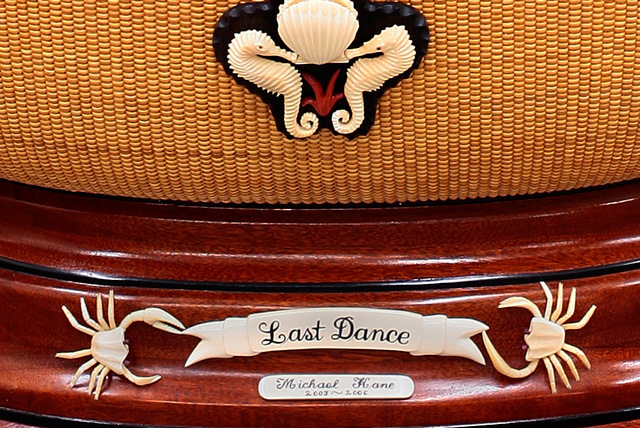 “Last Dance” took 4 years and many painstaking hours to complete from 2003 to 2006. 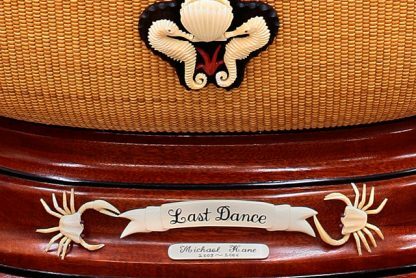 The name “Last Dance” came about because Michael said this will be his last really big piece. Last Dance starts from a hand-carved base, which is filled with 65lbs. of lead to keep it from toppling over. The woven basket on the bottom boasts a split cover with 180 shell carvings along the edge, 4 brontosaurus bone phids and many sea shells, crabs and seahorse carvings all done of antique whales tooth. The antique elephant ivory skirting around the top and bottom of the basket has scrimshaw Nantucket wildflowers by Dorothy Grant O’Hara. Inside there are sewing trays which have antique ivory spindles for thread and wood boxes with antique ivory lids and trays to hold needles. 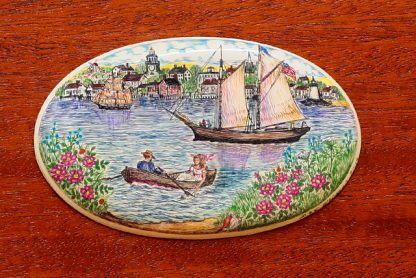 Each of the lids is scrimshawed with Nantucket Wildflowers. The split trays lift out for storage underneath. 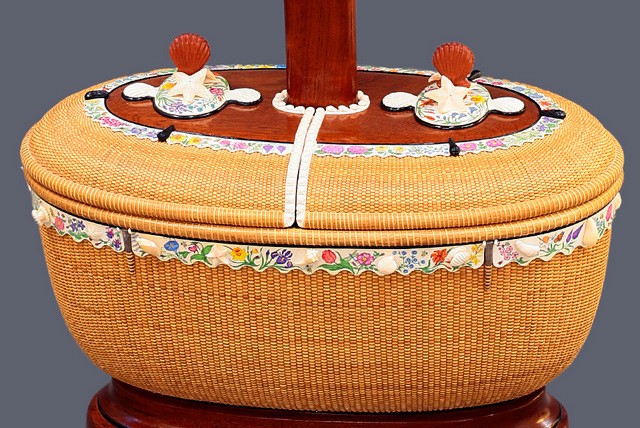 To connect the two baskets there is a Honduras mahogany post with a double inlay on both sides of antique ivory and ebony. 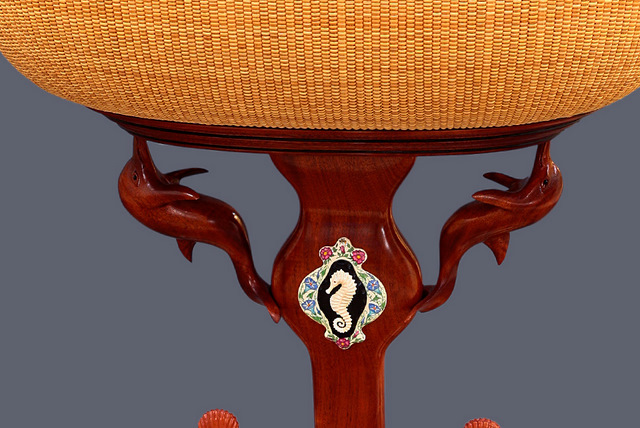 The center has a carved antique ivory seahorse and is finished off with scrimshaw wildflowers. Two Honduras mahogany carved dolphins appear to be holding the larger basket up. 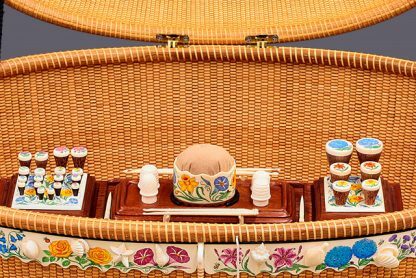 The larger basket has 3 drawers built into it. 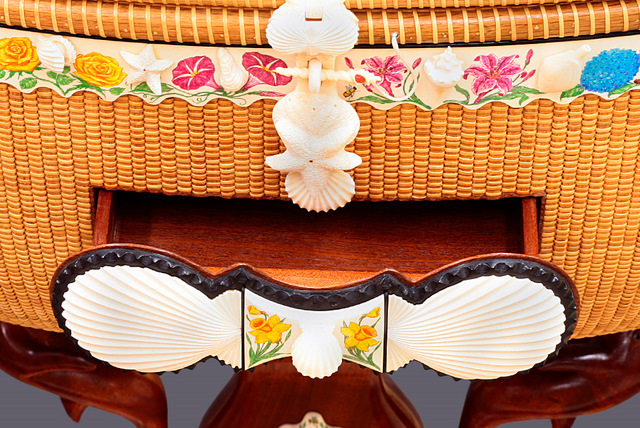 The scallop shell drawer in the front had never been done before and was quite a feat to cut. 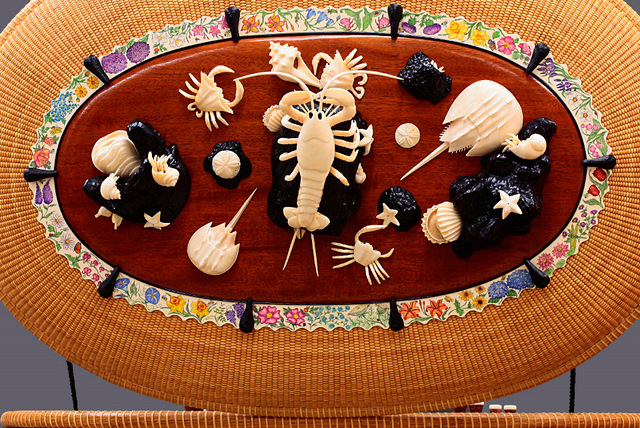 This basket also has the 4 brontosaurus bone phids, the antique elephant ivory skirting, with carved antique whales tooth shells and the scrimshaw work by Dorothy Grant O’Hara. 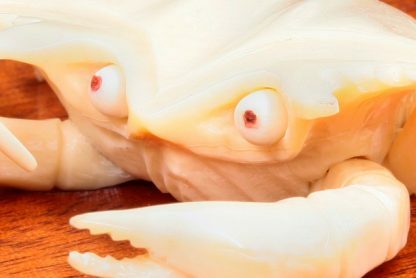 The clasp in the front is composed of eight different shells made from antique whales tooth. 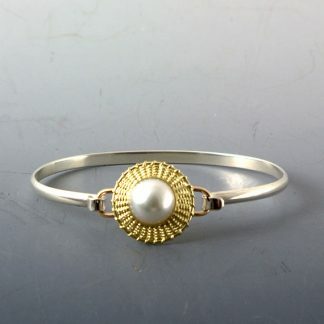 The clasp is fully carved on both sides. 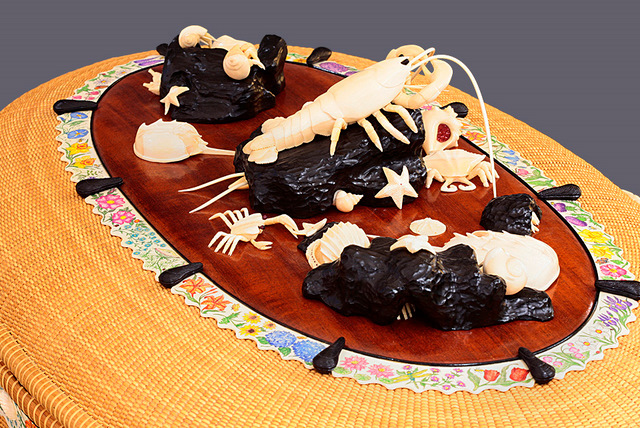 A carved lobster guards the top among a mixture of carved shells and crustaceans. The carvings are all carved from antique whales tooth except the horse shoe crab is carved from antique elephant ivory. 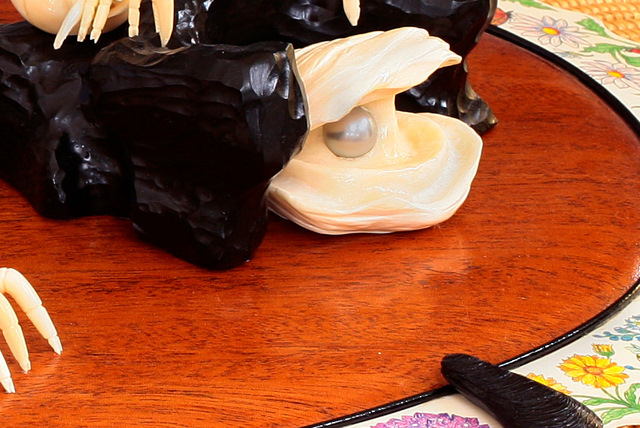 There is even an oyster bearing a Tahitian gray pearl that rests among the ebony rocks. When you open the basket there is a hondurus mahogany sotrage area in the front that has the other two drawers built in. 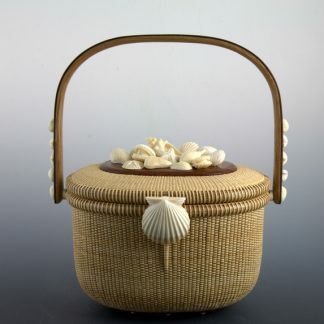 this is also the home for the antique ivory thimbles, pincushion, knitting needles and crochet hooks. To complete the piece inside the upper lid there is an antique ivory plaque with a scrimshaw scene of Nantucket Harbor. 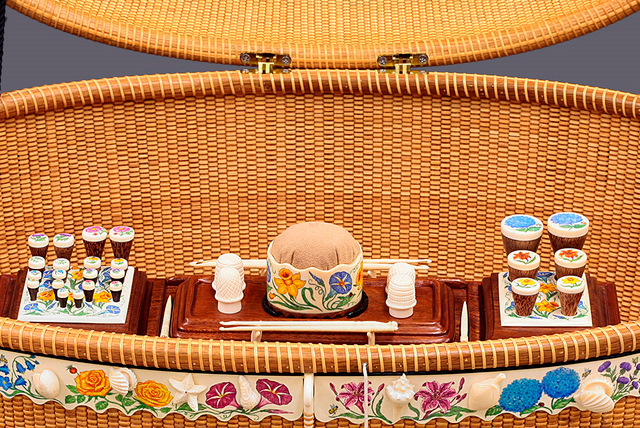 The baskets are both crafted with sturdy oak staves and woven with rattan. Michael is known to be the creator of the tight weave and he did not let his cliental down on this piece. 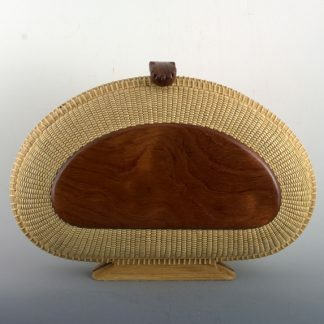 This basket has been talked about for so long it is practically an island legend. 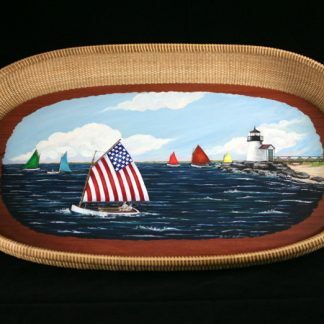 It has been featured in Nantucket Today and Cape Cod Life Magazines, numerous newpaper articles, on display at the Nantucket Lightship Basket Museum and most recently on the Martha Stewart Living show. If you are interested in purchasing this one of a kind piece feel free to contact us for more information.